Powered by the renowned online slot developer IGT, Water Dragons is a 5 reel and 30 pay line slot game. Based on the Japanese theme the game has vibrant symbols and graphics along with lively background music. The Water Dragons online is an exciting and enjoyable game with wilds, scatters and free spins abounding. The Water Dragons slots are compatible on all desktop computers including Windows, Mac, and Linux devices. Developed into online play in the year 2013 the game was originally developed in the brick and mortar casinos. The soothing Japanese music playing in the background well integrates the Japanese theme into the game. The play free Water Dragons casino slot machine represents a rich and beautiful Japanese theme represented through vibrant graphics. 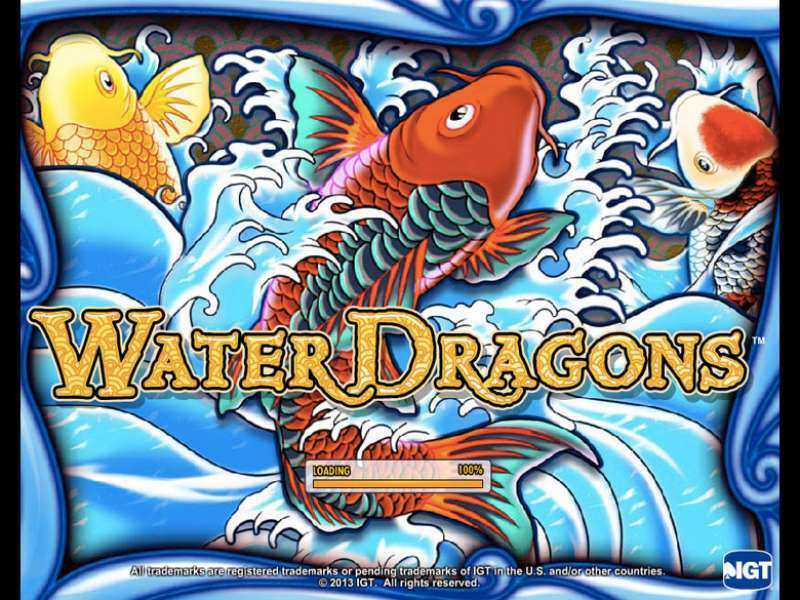 The theme of the Water Dragons online slot is well thought out and is represented on the reels with pond plants, Koi Carps, water lilies, dragonflies, Pearls, Bonsai tree and the Water Dragon logo. The pearls and the Water Dragons rank in as the prime symbols of the game. Acting as the wild symbol the Water Dragons logo substitutes all other symbols on the reels apart from Pearl. The Pearl is the scatter symbol of the game also the Pearl acts as the gateway to the free spins bonus round. This UK based no download game Water Dragons online has additional wilds added to the reels during free spins bonus round which further makes the game highly rewarding. Forwarding a number of betting options the game has impressive multipliers and premium quality graphics which makes the game attractive and enjoyable. 15 free spins are triggered if 3 pearls which are the scatter symbol appear anywhere on the reels. One interesting fact is in Water Dragons slot players are awarded bonus wins, namely the scatter pay which multiplies the total stake by 3x. The scatter symbol appears on the 2nd, 3rd, and 4th reels. If a pearl appears on any position at reel 5 it fills in one pearl next to a symbol at the bottom of the play screen. When 3 pearls fill in next to a symbol it forms a wild. The pearls fill themselves sequentially from left to right. The free spins are played on the same lines and it is also played as bet per line as triggering spin. The free spins bonus can be retriggered to a maximum of 225 free spins. In this regard, the player must note that the free spins bonus round comes to a close when there are zero free spins remaining or when the player reaches highest maximum award predetermined for the session. The players who want to play for real money can play Water Dragons online for free and no download and fill their pockets with loads of cash. This 5 reels 30 pay line slot is a penny game making it possible for players of diverse budget levels to get involved. The base gameplay provides abundant winning opportunities and allows one to win up to 30,000 credits. The maximum bet can go up to 600 credits and the payback percentage values between 85.5% and 96%. Water Dragons online also forwards the autoplay option which can set the spin to 10,20,30,40 or 50. The wins in the game are characterized by landing at least three symbols consecutively from left to right on a win line. In the Play free Water Dragon casino slot machine four fish symbols are the highest paying. 125 to 100 coins are paid out for the flowers, Bonsai, dragonfly and lamp. The Crimson fish pays out 750, Orange fish 400 and bluefish 300 when a player names full house of five symbols. The Tangerine color fish pays out 1000 coins. The win lines in the game are represented by bubbles on either side of the reels which further manifests the water theme. Even though the game has 30 pay lines it can be adjusted to 15, 9,5 and 1line as well. Featuring as one of the best slots powered by IGT Water Dragons online forwards to its players an enchanting game experience coupled with an Oriental theme. The game well integrates the Japanese culture with a simple and interactive interface with line bets, pay lines, wins and total bet amounts clearly indicated. With the option of altering the pay lines and playing it as a penny game Water Dragons scores big on its popularity base. With the pearls and Water Dragon logo being the prime symbols the game forwards several opportunities to multiply bets into big wins. Water Dragons is undeniably an interesting game with promising payouts. 0 responses to "Water Dragons Slot"